The ultimate guide to the ultimate storms, Hurricane Watch is a fascinating blend of science and history from one of the world’s foremost meteorologists and an award-winning science journalist. This in-depth look at these awe-inspiring acts of nature covers everything from the earliest efforts by seafarers at predicting storms to the way satellite imaging is revolutionizing hurricane forecasting. It reveals the latest information on hurricanes: their effects on ocean waves, the causes of the variable wind speeds in different parts of the storm, and the origins of the super-cooled shafts of water that vent at high altitudes. 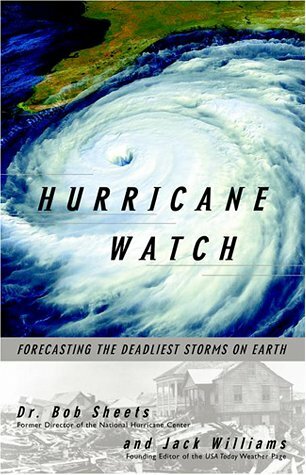 Hurricane Watch is a compelling history of man’s relationship with the deadliest storms on earth. - The story of the nineteenth-century Cuban Jesuit whose success at predicting the great cyclones was considered almost mystical. - A new look at Isaac Cline, whose infamous failure to predict the Galveston Hurricane left him obsessed with the devastating effects of storm surge. - The story of the Hurricane Hunters, including the first man ever to deliberately fly into a hurricane. - A complete account of how computer modeling has changed hurricane tracking. - A history of Project Stormfury: the only significant, organized effort to reduce the damaging strength of severe hurricanes. - A unique firsthand account of Hurricane Andrew by both authors, who were at the National Hurricane Center when Andrew struck. - A listing of the deadliest storms in history.